Sendera Draft colt Into the Void at his first show. 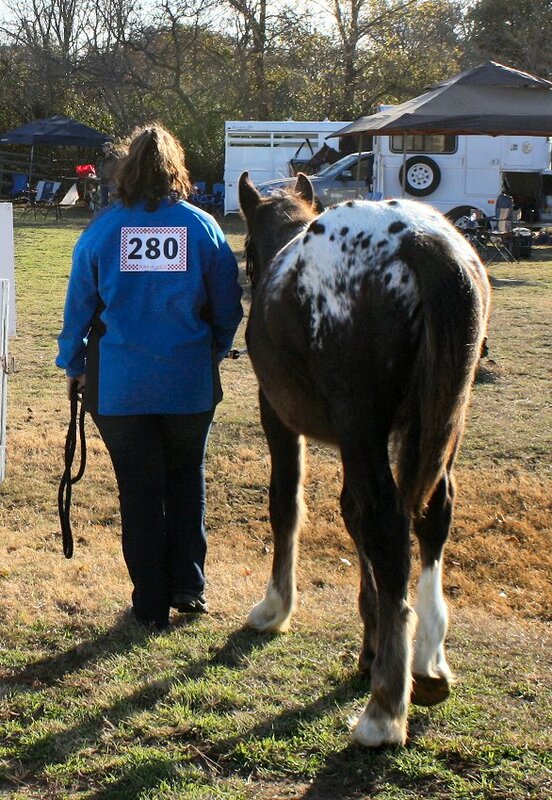 Ready to register a horse with the Sendera Draft Horse Registry? We offer three types of tracking: Sendera Draft, Showing Only, and Approved Breeding Cross. Horses who have two registered Sendera Draft Horse parents, or who have one registered Sendera Draft Horse parent and one registered Approved Cross parent, may be registered as a Sendera Draft Horse. Horses registered as part of the Foundation program are considered Sendera Draft Horses, so their offspring are also eligible. All horses applying for registration as a Sendera Draft Horse are required to complete basic genetic testing as part of the registration process. This genetic testing will include a genetic profile of the individual horse and testing for the genetic diseases listed on the genetic disease page. Foals whose parents both have clear genetic test results on file may only need to complete the individual profile. Offspring of a registered Sendera Draft Horse parent and a horse not documented as an Approved Cross with the SDHR require full genetic testing and a conformational analysis against the Breed Standard before registration. Based on the testing results and conformational analysis, they may or may not be granted registration. Please contact the Registrar for details. Interested? Have a horse to register? Download the Horse Registration Form to get started! Showing Only registration will be issued to horses who register with the SDHR under certain special circumstances: as a temporary status pending genetic testing; due to the results of genetic testing or as part of the genetic testing program; or at the specific request of the owner and breeder. These horses are restricted from breeding, and their foals will not be issued papers from the SDHR, regardless of the registration of the other parent. Depending on the reasons behind the Showing Only designation, these horses may be able to change their registration to Sendera Draft Horse at a later time. Horses who do not possess Sendera Draft Horse bloodlines and do not display pinto or Paint patterns may apply for Approved Breeding Cross status. Breeding a Sendera Draft Horse to a horse who has not been registered as an Approved Cross produces a foal that is not guaranteed registration, but the foals of Approved Cross horses and Sendera Draft Horses are eligible for full Sendera Draft registration just like the offspring of two Sendera Draft Horses. The Approved Cross process helps the SDHR maintain high standards of quality in foals while continuing to increase the numbers and genetic diversity of the breed. Conditional Approved Cross. Horses granted Conditional Approved Cross status must have approval of the Registry before each breeding, in order to ensure that their contribution to the breed continues to further the Breed Standard. General Approved Cross. Horses granted General Approved Cross status may breed to any registered Sendera Draft Horse, so long as the foal produced from such a breeding will possess a minimum of 50% draft ancestry. Open Approved Cross. Horses granted Open Approved Cross status may breed to any registered Sendera Draft Horse without restriction. Horses who do not meet the conformation minimums of the Conditional status will not be granted Approved Cross status. All horses applying for Approved Cross status are required to complete basic genetic testing as part of the registration process. This genetic testing will include a genetic profile of the individual horse and testing for the genetic diseases listed on the genetic disease page. Horses may also be required to complete white pattern testing on a case-by-case basis. Horses who test positive for prohibited white patterns or genetic diseases will not be issued Approved Cross status. Approved Cross horses who participate in the Show Program may earn the privilege of of an upgrade from Approved Cross to Foundation Sendera Draft. Check out the Show Program for details! Interested? Have a horse to register? Download the Approved Cross Registration Form to get started!